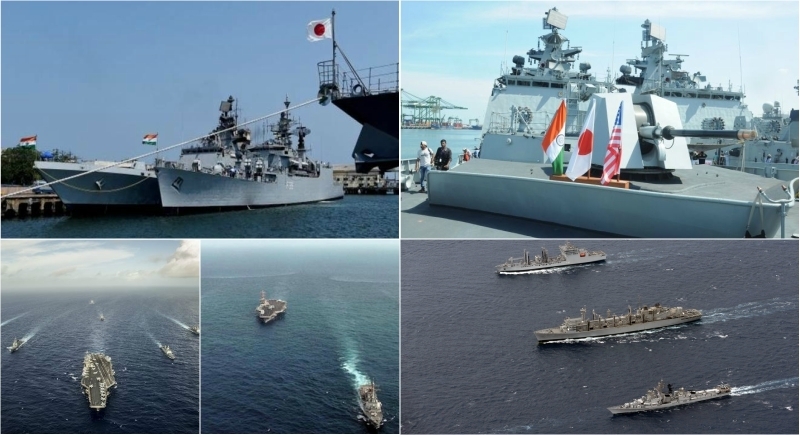 ﻿ News Bharati - Indian, US and Japan maritime forces aims for “Malabar Exercise 2018” focusing on "anti-submarine warfare" News Bharati - Indian, US and Japan maritime forces aims for “Malabar Exercise 2018” focusing on "anti-submarine warfare"
Indian, US and Japan maritime forces aims for “Malabar Exercise 2018” focusing on "anti-submarine warfare"
New Delhi, June 9: India, Japan, and the US are set to focus on "anti-submarine warfare" by deploying "different machines" during the next round of their marine war games named the ‘Malabar Exercise 2018’ held amid increased Chinese activities of building artificial islands in the South China Sea and sending submarines into the Indian Ocean. It is held off the coast of Guam for the first time, the exercise will advance the level of cooperation and readiness among these Indo-Pacific partner nations' Sailors. During this exercise, they will practice surface and anti-submarine warfare operations and combined carrier strike group operations off the Coast of Guam Island in the western Pacific. The exercise kicked off at June 7 will continue till June 16. Started first after the US renamed its Hawaii-based Pacific command as the Indo-Pacific Command. US Secretary of Defense James Mattis welcomed Admiral Phil Davidson in his new role taking the charge of the combat command. Malabar will be done in two phases: ashore and at-sea training. The harbor phase will occur at Naval Base Guam from June 7 to 10 and the sea phase from June 11 to 16 in the Philippine Sea. While ashore in Guam, training will include subject matter expert and professional exchanges on carrier strike group operations, maritime patrol and reconnaissance operations, surface and anti-submarine warfare, medical operations, damage control, helicopter operations and visit, board, search and seizure (VBSS) operations.